Claudia Valentina Trio is a musical project of soulful Latin folklore that includes classic rancheras and boleros, with rooted, original arrangements and new interpretations of songs by the likes of José Alfredo Jimenez, Pablo Milanés and Juan Gabriel. Bahião, cumbia and son jarocho are just a few of the rhythms explored on this emotional journey to other places and times of Latin America, and more importantly, to other places and times of life, as it happens. 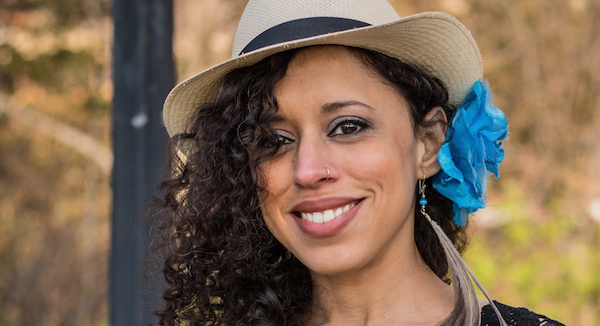 As a musician and dancer, Claudia Valentina has recorded and toured the US and Mexico, singing in Spanish, playing the jarana (a string instrument from Veracruz) and doing traditional percussive dance on a tarima (wooden box) with the Afromexican NY-based Jarana Beat, winners of the 2015 Mexican Music Award for Best Contemporary Folk Band. Collaborations have included Claudia on guitar, vocals and dance with the likes of Grammy Award winning group Dan Zanes And Friends, children’s educational groups Bilingual Birdies and Mexico Beyond Mariachi and the all female band Mariachi Flor de Toloache. Claudia Valentina Trio at Terraza 7 on Monday February 13th, 2017 at 9:00 pm. No Replies to "Claudia Valentina Trio"